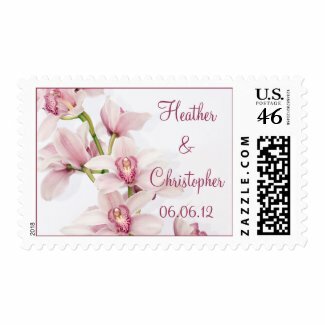 The lighter pink Cymbidium orchid variety has a particularly soft and romantic feel. It’s additional symbolic meaning is “pure affection”. It’s a larger sized orchid, making it perfect for wedding bouquets as well as boutonnières, corsages, center pieces, and other floral arrangements. It makes a nice flower on a wedding cake as well. It is versatile enough to form the basis of a wedding in any season, because of the variety of shades within the flower. Colors also have symbolic meanings. For example, pink is a calming color thought to represent femininity and romance. The deeper shades add a bit of drama and represent passion. Yellow symbolizes cheerfulness and optimism. Green, a very popular color with both women and men, represents health, vitality, nature and fertility. It is also a relaxing color. 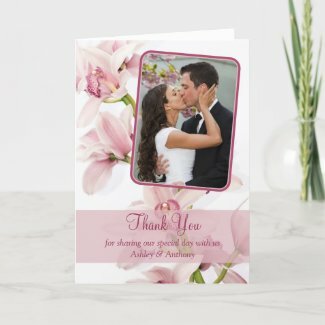 All taken together, this pink Cymbidium orchid color palette and theme represents all the positive aspects of love and romance. And it does this in an elegant, luxurious way without being overly bold or sedate. Depending on how much of the wine color you use in the wedding will make it more or less suitable for particular seasons. Add in more touches of the wine color, and this theme works well for both winter and fall. Add in less wine and use more of the green and yellow and you’ve got a nice recipe for a spring or summer wedding. We’ve collected a few great finds that really show how beautiful this color palette can look! First, we found this fantastic cake from Jacques Fine European Pastries. It’s a gorgeous orchid cascade cake! Very beautiful. 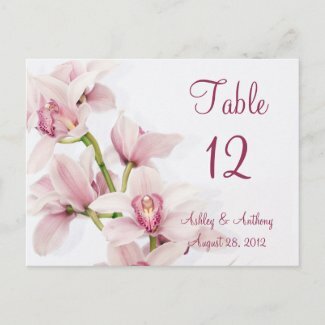 The soft colors and two varieties of orchids really makes for a lovely wedding cake. We found this Strawberry Farms Rustic Love | Vintage Themed Wedding Photography blog post on Bethany Belle featuring a real wedding utilizing many of the colors in our pink Cymbidium orchid wedding color palette. The wedding and the wedding party looked fantastic. The groom and groomsmen in grey really worked well with this theme. We also found some great wedding bouquets that are showcase this color palette well. Here are some of the choices that we found. 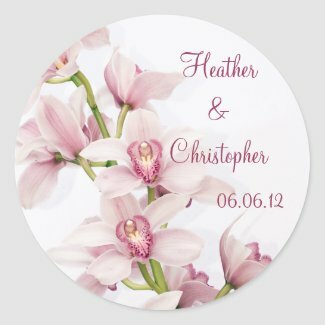 This is a lovely Cymbidium orchid and Calla lily bouquet. It features the colors in our theme, leaning more towards the pinks. This one is showcasing a darker style and would work really well for an autumn or winter wedding. Emphasizing the wine color really brings out the drama. But, this theme is very versatile and you can lighten it up as well for spring or summer weddings. Add in some pale yellow, a few more greens, and more of the lighter pink and you’ve got a great look for a spring or summer wedding. Or, leave it as is and go with rose petal pink colored bridesmaid dresses to lighten up the overall look for spring or summer. Below is a lovely pink, green, and white “real wedding” bouquet we found on magnetstreet.com. 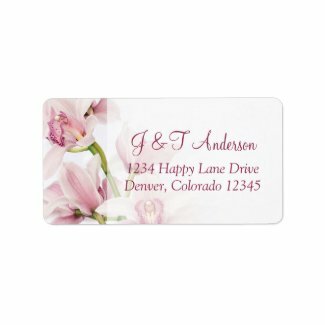 It also features the colors in our theme, leaning more towards a lighter overall version that looks very soft and romantic and would fit spring or summer weddings well. Also from magnetstreet.com, we found these “real wedding” images of a bouquet and wedding details. This incorporates more of the green and adds in a little purple. It has a spring or summer feel. David’s bridal has a wonderful selection of bridesmaid dresses that would fit well with this theme. In particular, their Wine and Rose Petal colors are a beautiful fit. Here’s an example of couple of different styles featuring these colors. 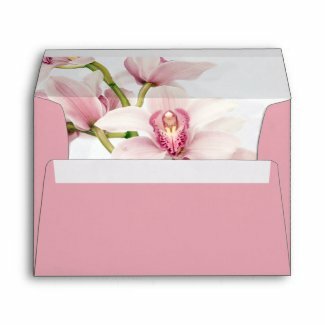 Shown below is a pink Cymbidium orchid wedding invitation and stationery set that we’ve designed. It incorporates the beauty of this flower in an elegant, yet soft and romantic way. As you can see, there are a variety of matching products to choose from. Most of the text on the products can easily be personalized with your own text. 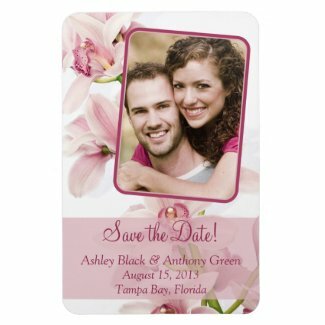 Also, the invitations, save the date announcements, thank you cards, and reply cards come with standard white envelopes, but you can also order a specially designed envelopes to go with the invitation or thank you card. If you require any changes to any of the products, or if you require any additional products for this set, please contact us using the “About” tab above and filling out the contact form on the “contact us” page. Not all the available products are shown below. 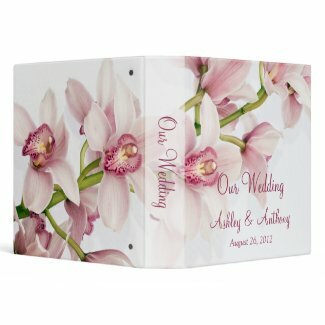 Visit our orchid wedding products section to see more. This theme is perfect for a wedding, but it would also make a wonderful theme for any other special occasion. For example, it would make a nice theme for a graduation, retirement, special birthday, anniversary, Bat Mitzvah, or any other celebration. The great thing about the stationery set posted above is that the text can be customized to work for any special occasion you want. If you want to use these items for another special occasion and you aren’t sure how to change the text, message us and we will help you out.